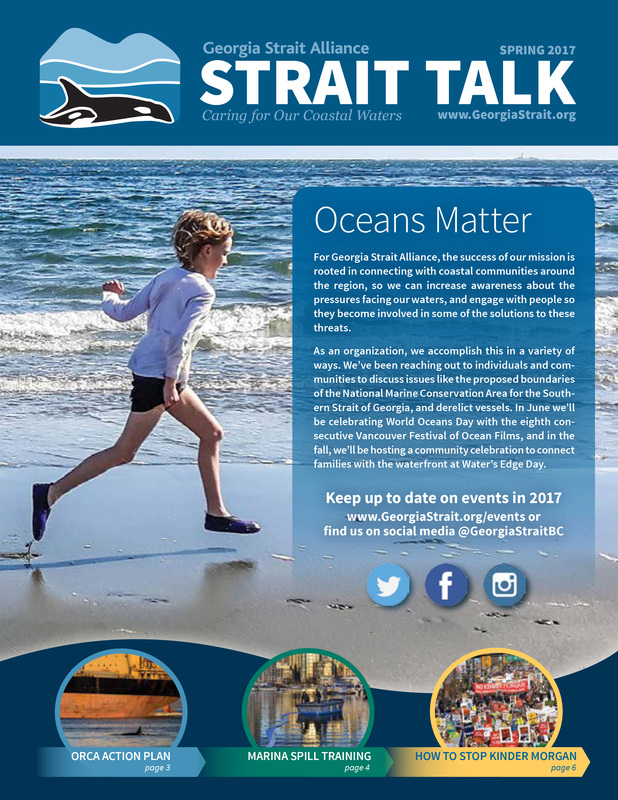 Strait Talk is published twice a year by the Georgia Strait Alliance and provides updates on our activities and other items of importance to the marine environment in and around Georgia Strait. It is distributed free in digital or printed form. Hard copies are sent to our members and you can become a member by making a donation of any amount. With support from people like you, we’ve been able to get beyond unexpected roadblocks by redirecting our efforts to where they will have the greatest impact for our coastal communities and advance marine conservation. 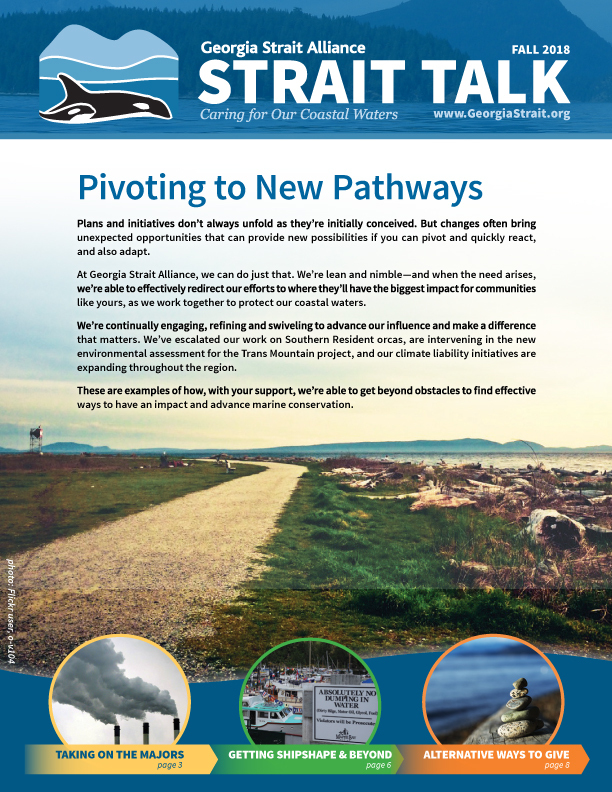 Gathering, celebrating and mobilizing – Moving mountains to defend our coast: if we protect the Strait, we are protecting the orca from the host of risks associated with increased tanker traffic. 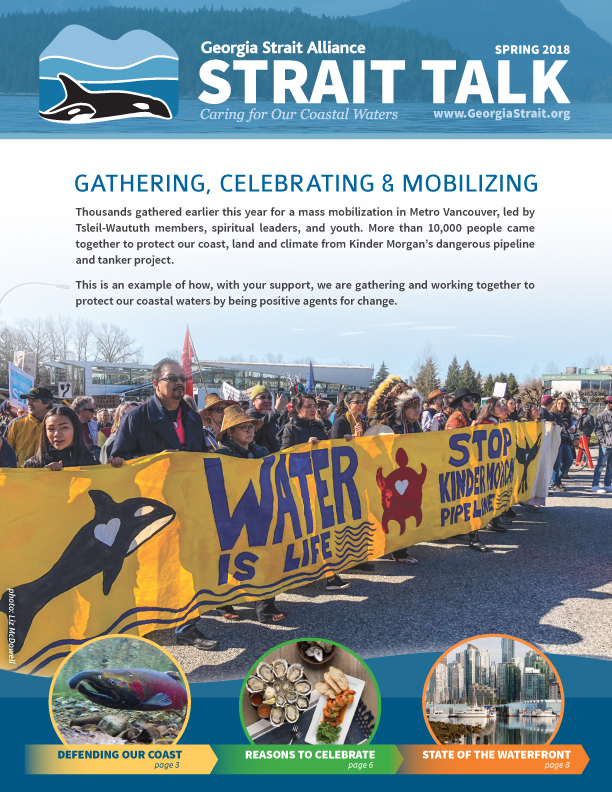 Reasons to celebrate: we joined thousands to protest the Kinder Morgan pipeline project, raised money with good food and art. State of the waterfront: we’ve released the first-ever State of the Waterfront Report for Vancouver. Partnering to support marine outreach: challenging kids to create a video about helping to improve the health of the oceans and doing outreach with local business to raise awareness about southern resident orcas. Providing fun community events such as Water’s Edge Day, where people can connect with their local Salish Sea – Building on our accelerated and expanded efforts to give orcas a voice, to bring awareness to and highlight the severity of the current situation, and to advocate for concrete measures that can restore the species’ critical habitat in our coastal waters – Supporting actions that lead to delays in Kinder Morgan’s pipeline and tanker project, because “climate leaders don’t build pipelines” – Helping more boating facilities keep our waters clean by implementing environmental best practices through our Clean Marine BC eco-certification program. A new world of alternative facts: how can consensus be built for the kind of world we want to live in when facts are optional? – Urgent action or extinction: an update on the next steps needed for the orca action plan – Clean Marine BC expands to prepare marinas for oil spills – How to stop Kinder Morgan – State of the waterfront: Preliminary analysis is done – Worlds away from ‘world-leading’: Only a name change to spill response in BC – snapshot of our first Wine on the Waterfront event. 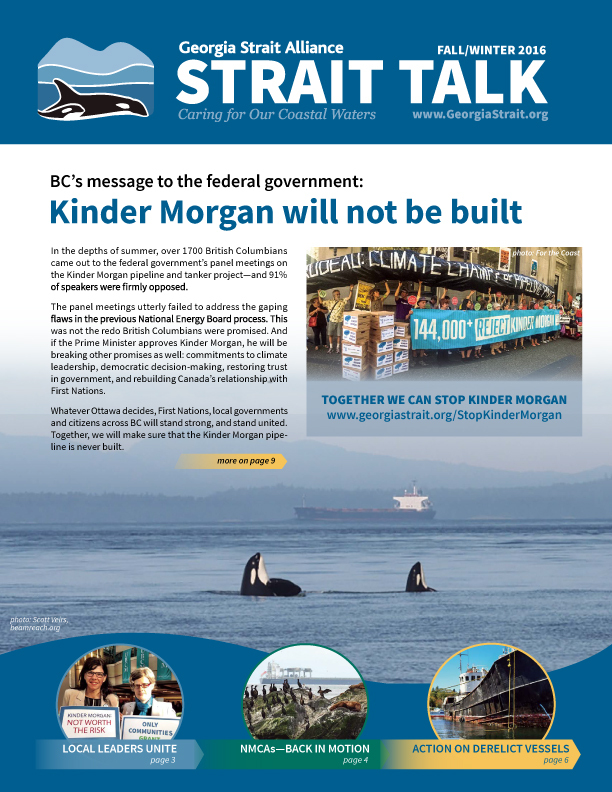 Bridging Boundaries – You Can Stop Kinder Morgan, find out how you can have your say this summer – Leaving a Legacy: important information on how to – Hope on Derelict Vessels and welcome to new CMBC members – Will the Province get it right on spill response in BC? – What is the Waterfront Initiative and program update. 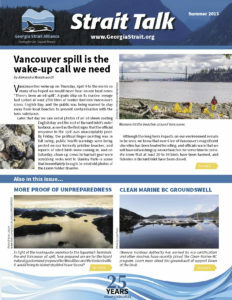 Vancouver spill is the wake-up call we need – A waterfront for all, GSA holds its first Citizen’s Forum and more – Ride the groundswell with CMBC – Preparing and responding to oil spills at the local level – Hitting the streets to Save the Salish Sea – Squamish fire, more proof of unpreparedness – Our 25th Anniversary; our website upgrade, a look at our achievements, who makes them possible and how you can get involved! – Meet our new Board of Directors – and much more! How Vancouverites connected with the water on Water’s Edge Day – Join the conversation to envision a positive future for Vancouver’s waterfront – We’re glad it’s not oil, yet! 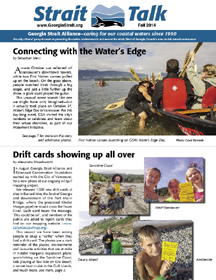 See some locations where drift cards washed up around the Salish Sea – Our cross-border campaign takes flight, join the movement at www.SalishSeaAction.org – Communities can lead where governments fail to do so – Gabriola Islanders Help the Kelp, how citizen scientists are mapping the local kelp beds – Are there local impacts from Fukushima? – Meet our new Board of Directors – and much more! 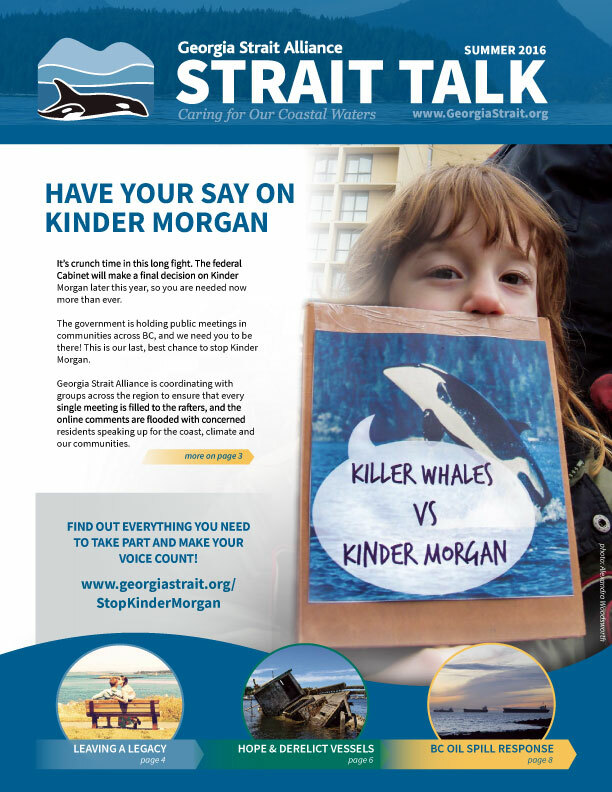 Kinder-Morgan’s Trans-Mountain pipeline proposal is now before the National Energy Board – How far could spilled oil travel along B.C.’s coast? Our drift-card study offers an unsettling answer – The Waterfront Initiative begins building its vision for Vancouver’s shoreline by hosting its first Network Forum – Margaret Sizmann Estate benefits GSA – Meet our 2014 summer students, Natalie Drope and Ryan Butler and new Director, Rachel Forbes – CMBC applauds Shelter Island and Maple Bay Marinas for their recent four-Anchor environmental rating. 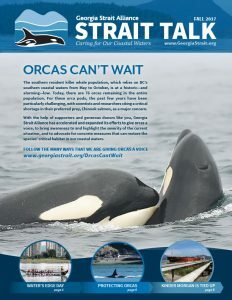 Save the Salish Sea campaign heats up – Find out about the next step in our waterfront vision – Learn how GSA is setting the stage for change – Take the Green Boater pledge – Some good news for Orca protection from acoustic noise – and much more! 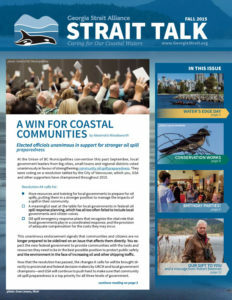 The launch of “Save the Salish Sea” – an initiative to oppose the Kinder Morgan expansion – Our assessment of the BC election results – Details on the re-launch of our “Stewards of the Strait” program – The latest on our exciting and unique “Waterfront Initiative” to build healthy waterfronts – A beautiful profile of a long-time supporter who left a bequest to GSA – Some amazing pictures of our work and our region, and much, much more!